Heartbreak is not easy on the mind or the body. What do those visceral feelings look like? Using 3 months of data gathered by Sleep Cycle (an iPhone app), each axis depicts an aspect of sleep quality, like time spent asleep or sleep quality, during a breakup. 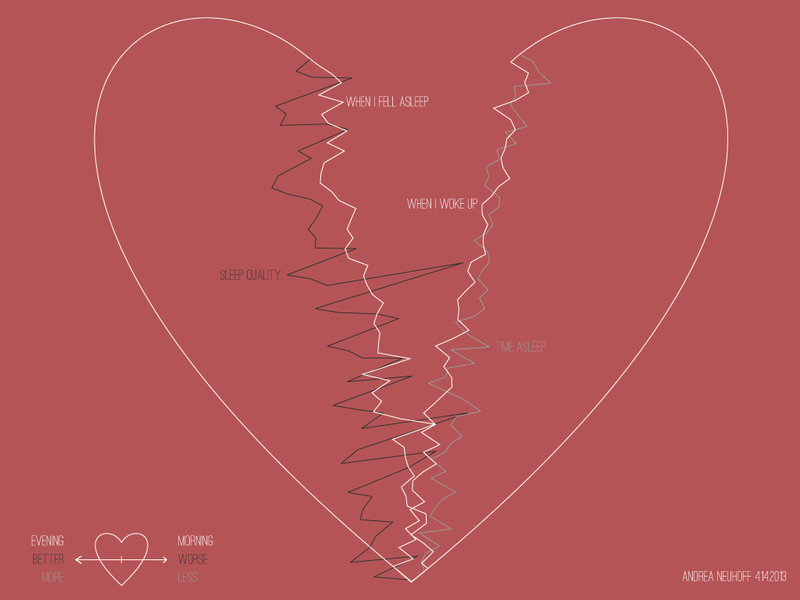 The jagged line connected to the left half of the heart shows when I went to bed each night, while the white line connected to the right half shows when I woke up each morning. Time, the y-axis, starts at the bottom of the heart progresses upward. The breakup happened roughly where the lines begin to separate. These two lines are tilted in different directions and thus cannot show how the quantity of sleep I received each night. The light grey line provides this information (how much I slept each night), and the dark grey line shows the quality of the sleep I received each night.